In his first joint address to the US Congress, President Trump gave a speech which many commentators are calling one of the greatest such speeches in recent US history. It was direct, clear, powerful, and appeared sincere. Seemingly as a result, Ben Carson's stalled confirmation as HUD director appears to be back on track and the normally vocal Democrats have fallen almost completely silent. This speech may turn out to be a "turning of the tide" moment in Trump's reign. Sun conjunct Neptune in the Fifth House: dreams (or deception) shine forth. Mercury conjunct South Node in the Fifth House opposite North Node in Virgo in the Eleventh: not a lot of the usual boasting -- just a lot of talk about working to improve and repair society. T-square with Jupiter rising opposite Mars and Uranus on the Descendant, square Pluto at the IC: optimism and hope on its face, delivering aggressive disruption (Mars/Uranus) and destruction (Pluto) to political enemies (Descendant and IC). 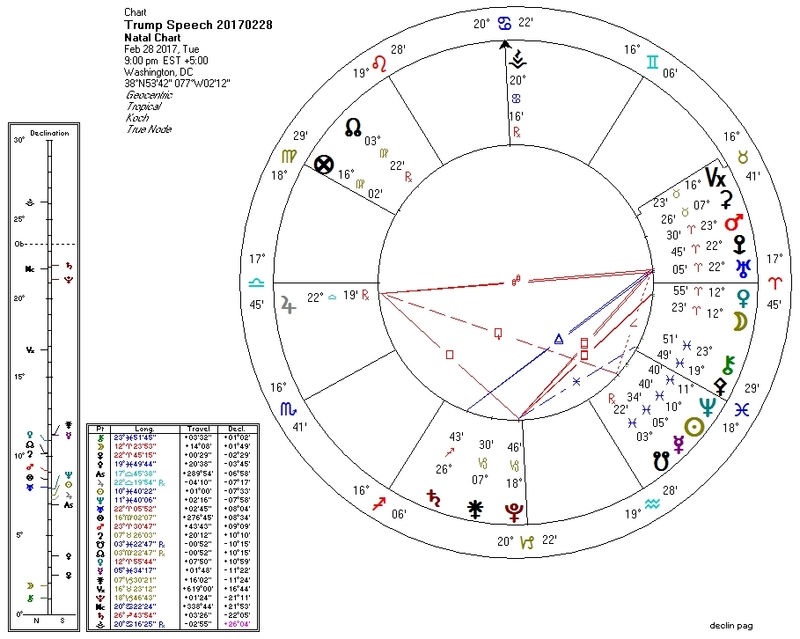 Moon conjunct Venus: a harbinger of prosperity to the people? Cancer on the MC: family/tribe/nation above all else.